My new wallpaper turned out waaay better than I thought it would. Re: My new wallpaper turned out waaay better than I thought it would. Looks like a Last.fm cloud to me, correct? Yup. Used http://lastfm.dontdrinkandroot.net/ to generate the cloud, export it to pdf, then used inkscape to trace it to a large png. The rest of the work I did in gimp. 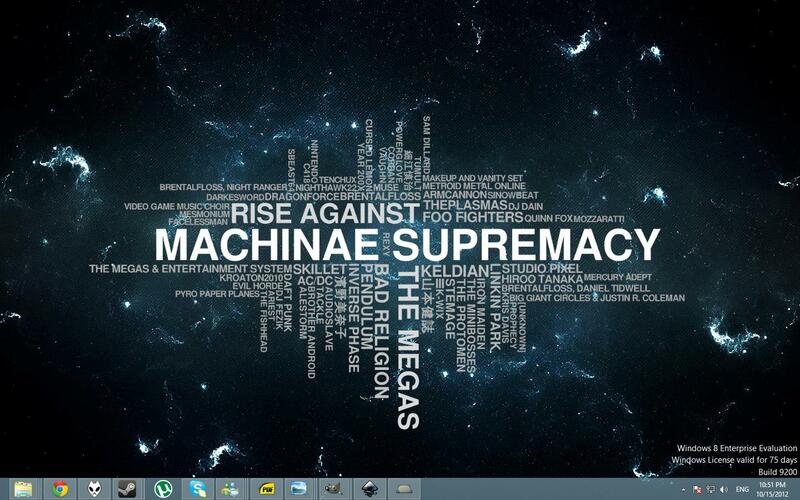 Oh, that is cool but it would be more perfect if that is an overlapping word cloud and you just emphasize the Machinea Supremacy word. That idea is what I have been doing in my business site and the designs was created by http://www.digiteksf.com/.